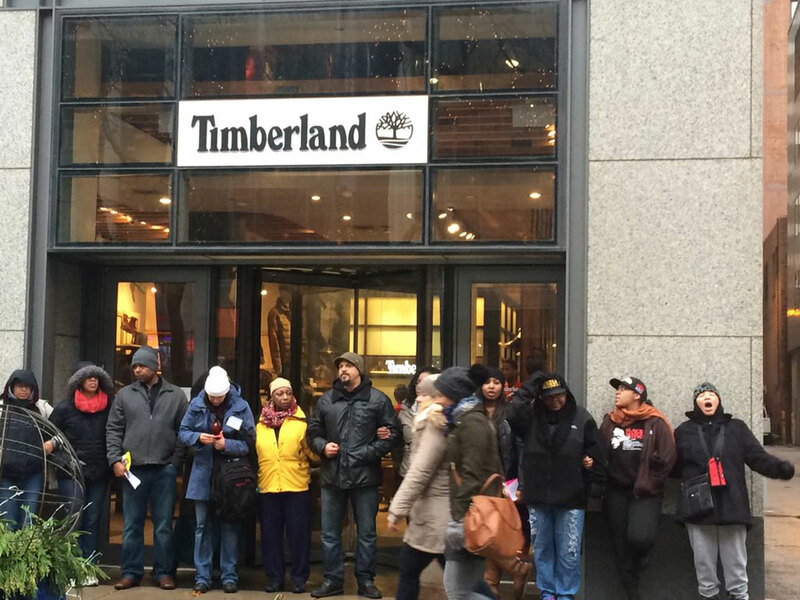 Protesters blocked stores along Michigan Avenue on “Black Friday,” November 27, 2015, in protest of the fatal shooting of 17-year-old Laquan McDonald by a white police officer. Chicago Police Department superintendent Garry McCarthy was fired by Mayor Emanuel last Tuesday, after protesters have been demanding it for months. Back in October, members of the Black Caucus of the city council demanded his replacement because crime is still rampant in their wards and he hadn’t hired enough Black officers in high positions in the police department. In light of the release of the video showing police officer Van Dyke murdering Laquan McDonald last year, most residents of Chicago will probably admit that the police department needs a major overhaul to improve community relations and end police brutality. Since the video’s release, more aldermen called for McCarthy’s resignation as well as that of Cook County State’s Attorney Anita Alvarez for their role in the cover-up of the murder of Laquan. Police departments across the U.S. have a deep legacy of brutality against African Americans. In 1968, Black police in Chicago created the Afro-American Patrolman’s League to fight against police brutality and to improve community relations in Black neighborhoods. At that time, 15% of the police force was Black compared to 35% for the city population. Today, only 25% of the CPD is Black compared to 33% of the general population. The CPD has been forced by several federal lawsuits to improve diversity in hiring over the last several decades. Hiring and promoting more officers of color is a step in the right direction: research shows there are numerous benefits to a diverse police force and many believe that the murders by police of Michael Brown in Ferguson and Eric Gardner in New York would not have happened if the police forces there were more diverse. There are also a lot of people who do not think that simply having a more diverse police force is the answer and think that hiring more police into a broken system is not the solution. The CPD has paid half a billion dollars in police brutality cases in the last 11 years – that averages to over $45 million per year. Black Youth Project 100 summed it up perfectly: “…no city should spend 40% of its budget on policing our lives while systematically destroying our communities.” The Chicago Teachers Union joined a coalition of civic rights organizations at the Black Friday protests on Michigan Avenue, demanding an independent, elected Civilian Police Accountability Council (CPAC) instead of the Police Accountability Task Force that Mayor Emanuel has promised. This is especially urgent in light of the fact that Emanuel already had such a task force two years ago and simply shelved its report, and now new evidence has linked Van Dyke to another cover-up of a police murder years ago. Unfortunately, some people in Chicago have also called for an increase in arrests. Calling these “quality of life” crimes, and making reference to the “broken windows theory,” these advocates think that spending tax money to arrest, jail and prosecute residents for petty crimes is the best way to clean up their communities and prevent more serious crimes from taking place. …good broken windows policing seeks partners to address it: social workers, city code enforcers, business improvement district staff, teachers, medical personnel, clergy, and others. The goal is to reduce the level of disorder in public spaces so that citizens feel safe, are able to use them, and businesses thrive. Arrest of an offender is supposed to be a last resort—not the first. More arrests are not the answer. The communities where people are advocating for more arrests already have high arrest and incarceration rates. A Just Chicago discusses some of the negative impacts parental incarceration has on children and how it affects their ability to thrive in school. the communities most likely targeted by “quality of life” arrests – low-income Black and Latino areas on the west and south sides – also have low to very low Child Opportunity Index rates. This analysis is based on combining data on indicators of Educational Opportunity, Health and Environmental Opportunity, and Social and Economic Opportunity. Arresting more adults for petty crimes will result in a diminished quality of life for the children growing up in these areas. While the Chicago Police Department needs to work with communities to figure out the best ways to reduce and prevent crime – especially the violent crime that is killing our innocent children – the “quality of life” crimes – such as selling loose cigarettes, drinking in public or gambling – are best dealt with by increasing community resources and opportunities. Don’t forget that Michael Brown was stopped by police for jaywalking, Eric Gardner for selling loose cigarettes, and Sandra Bland for changing lanes without signaling. All petty crimes with fatal results at the hands of the police. “Poor people, especially people of color, face a far greater risk of being fined, arrested, and even incarcerated for minor offenses than other Americans,” according to a new report by Karen Dolan of the Institute for Policy Studies. Thus, Chicago communities need more resources not more arrests. We need to invest in the schools, create community schools that offer programs during the day and evening for community residents, expand the capacity of community-based organizations to provide their services, and seriously invest in economic development. What our city needs is more opportunities for employment, job training, access to quality health care, affordable housing. Our communities need economic development. The overlap of crime and lack of opportunity is strikingly clear. Anita Alvarez, community development, disinvestment, incarceration, jobs, police brutality, poverty, racism. Bookmark.